UDM Downloads > GenoPro 2007! 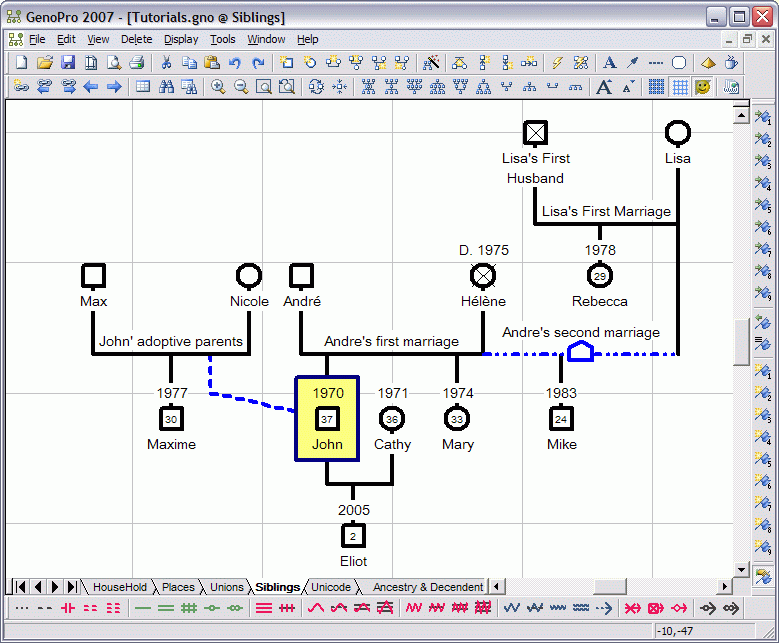 GenoPro is a specialized tool for drawing family trees and genograms. GenoPro's intuitive graphical user interface quickly produces professional-looking pedigree family trees ready for printing or for pasting to any presentation software. GenoPro is more than genealogy; it can visually document an entire community, including emotional relationships and social connections among people. GenoPro 2007 offers the flexibility to enter as many details as you wish, including education records, occupations, contacts, places, pictures, sources and citations. GenoPro 2007 is intelligent, as it avoids redundant data, and it also features a built-in auto-complete function to speed up typing and reduce typos. With a few mouse clicks, you can generate a report of your family tree for further review or for sharing with others on the Web. Version 2.0.0.2 improved report generator to better display places on Google Map; fixed code to always copy pictures to HTML reports when publishing to the site; and alow the user to change the printer paper orientation from the Print Setup as well as the Page Setup dialog.